The Ride Helix seems to be the replacement for the old classic camber DH snowboard. It feels like it’s one part Buck Up and one part new Asym. It’s a pretty ultra damp aggressive ride. The 2019 Ride Helix has stayed pretty much the same ride spec wise but there was a little softening of the flex since we rode it. So most of the old review still stands. There is a growing number of Asymmetrical boards out there these days and I say the more the merrier. Asym boards like this help the rider turn easier on their heel side and we found they help you ride switch better as well. What I mean by better switch most of us aren’t as strong riding switch as we are regular so the asymmetrical side cuts make it easier for us to turn when we don’t have as much game going on with the wrong foot forward. So keep these types of boards coming Ride. Turn Initiation: Nice quick turn initiation that isn’t easy but if you know how to turn it’s fun and quick. I found myself turning a lot of tight quick turns before going wider and I enjoyed all widths of turns with this board. Turning Experience: Fun board to turn regular or switch and it’s great for riding the mountain making all kinds of turns. Skidded Turns: Not ideal for beginners but more forgiving than Camber rides. Carving: The Ride Helix can carve pretty well. Especially if you want to carve either way pretty well as long as the snow is softer. Flex: Feels medium bordering on Medium Stiff. Not quite a board that was super easy to butter and play around. I could butter but it was a little more work than many twins I’ve tried. Edge Hold: Felt pretty good but not bottomless. In the firm morning conditions the Helix held fine enough so I’d say it’s a borderline hard snow kind of board. It’s better in medium conditions but you can go out in hard snow and keep an edge. Powder: No powder but this didn’t seem like something I’d want to be out on. I’ve ridden this type of camber profile on a few different boards from Ride and it seems like it’s a step above camber in terms of float but it’s not quite something that competes with other hybrid shapes that have more rocker going on. Carving: For a twin with not too much camber going on it’s got a good spring out of a carve. The old camber DH is better but it’s right on par with the other hybrid camber boards with ride. It was easier of course to carve switch. Speed: Very fast for a twin and to me it felt more at home at higher speeds on the mountain than in the park. Well except for those that go really big in the park. It’s not a freeride bomber but it’s very damp and fast for a twin. It also keeps it’s speed well when on longer flat cat tracks. 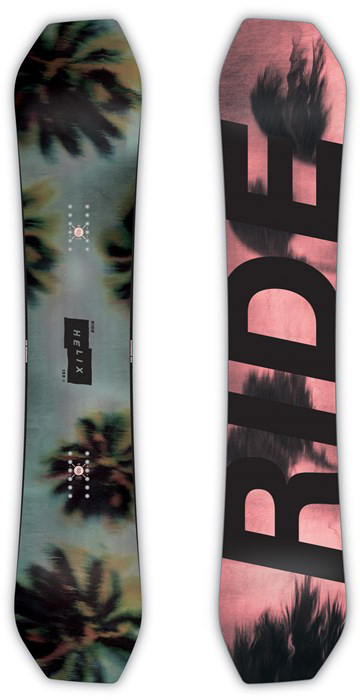 Uneven Terrain: Ride makes boards that don’t pass much feeling through so this board could handle small fields bumpy/uneven snow much better than most in it’s class. It’s also pretty quick in and out of rutted up snow that you have to approach at slower speeds. Switch: I mentioned this before but the heel side friendly side cut makes it easier for someone to ride switch than even a true twin. For some reason with almost any asymmetrical board I just get into the switch rhythm faster and I feel more confident. It just seems to be easier with the weaker foot forward. So if you ride switch a lot then this or other good asymmetrical boards will help. Jumps: Most Ride boards feel rubbery and a little dull so it can be a little deceptive when it comes to an ollie. It feels different but it pops just fine and I’d say above average. It’s also great approaching a kicker. Jibbing: I’m not a strong jibber and the stiffer flex didn’t make me want to go there. Pipe: I rode the Ride Helix on a mountain (Heavenly) without a pipe but I really wanted to take it in one. I could just tell this would be fun. It’s got pretty good edge hold bordering on being competent on hard snow and it’s got a nice carvy camber drive edge to edge so it would be good going from wall to wall. I think a lot of more experienced pipe riders would like this. All in all the Ride Helix is a fun aggressive all mountain twin that I think a lot of riders could have fun on. Especially if you are a fan of Rides riding personality you will be pretty stoked on the Helix. We try to get as many images of the Ride Helix, but forgive us if they're not all there. Love my ride helix.Traded a prototype two for it can couldnt be happier. Wanted a board w camber and and mid flex. Once this board breaks in a little itll be easier to butter/ I love it for park, jumps,switch, rails and carving. Just love this board and how it rides. Love how solid it feels spinning and landing big jumps.When snow is icy I'll use Ripsaw and dont really know if this will be awesome. I use the slinger when its soft and just park days but will be riding the helix most other days. To me its very similiar to the capita spring break. Love this board and glad I traded for it. Just finished demo'ing this board in 159 and 157 lengths along with a 157 Machete GT. Had a full camber Lib Tech Total Ripper from about 8 years back. This board truly helped correct my flaws. I am an intermediate rider, and this thing just carves so easily. Riding switch was better than I ever have before. The Machete GT gave me the same issues as my old Lib Tech, and I couldn't feel confident on the Machete GT. However on the Helix everything just seemed easy. When I messed up, the board really helped me reagain control. I can't say how much I love this board as it simply mmade me a better rider. This is a great replacement for my old board. Got the 157 as it was easier to control, but both lengths just madde riding easy.